Help “Cultivate ASAN” in 2017! ASAN Welcomes New Development Director AND Grows Into New Office Space! 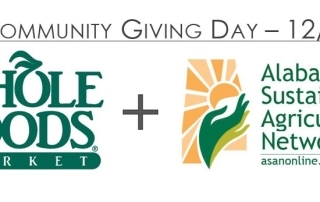 ASAN to Receive Proceeds from Whole Foods Market Mountain Brook’s 5% Community Giving Day on December 8! Graze: Birmingham tickets – SOLD OUT! Uh oh, it seems we're SOLD OUT of the ticket you're trying to purchase! If you think you've reached this page in error, please contact [email protected] or [email protected] Hope you make plans to GRAZE with us next year!